When Option Workshop successfully connects to a data source, it fills the list of accounts with data loaded from an external system. For example, on the screenshot below, Option Workshop has loaded two accounts: Account1 and Account2. 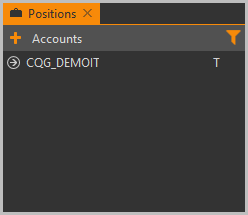 If an account contains any positions (and thus any strategies) then its item in the account list is expandable by clicking the button. When expanded, it shows a sublist of strategy groups – these groups are called asset portfolios. Each portfolio is associated with a specific asset and contains only strategies on this asset – so strategies are grouped by their asset. On the screenshot below, Account1 contains three portfolios: AAPL, AAOI, and GOOG. By selecting a portfolio in the sublist we get a list of strategies on the selected asset contained in the selected account. Choosing a strategy in the left block will open a list of positions. Trading, loaded from the data source. The T mark is displayed next to the account name. The L mark indicates accounts, which are used by any trading automation tools. 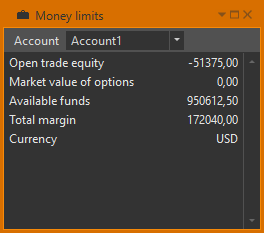 You may view the trader's account limit by right-clicking on the account and choosing the View money limits command from menu. This command is available only for trade accounts. On the following window, you can find the information about Account1. The set of parameters depends on the trading system. 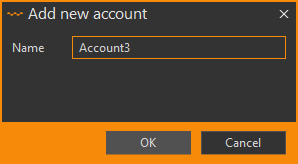 Enter the desired account name in the text field. Click the OK button (you also may press the Enter key on keyboard). Note that the account name cannot be empty. If you create an account and then another account with the same name is loaded from the data source, these two accounts will be merged into one single account. 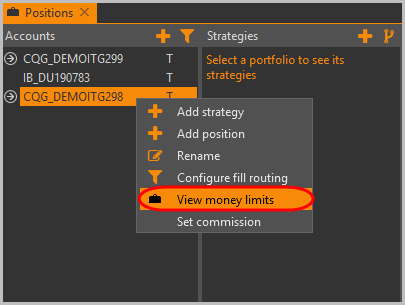 The list of strategies and positions of the loaded account will be added to the existing one. Double-click on the account name or right-click on the account and select the Rename command from the menu. 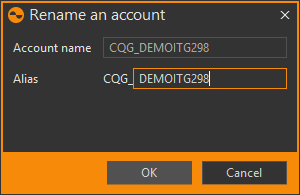 Enter the account name in the Alias field. To return to the original account name, click the Reset to default value button. Right-click on the account to be deleted. Select the Delete command from the menu. Click the OK button in the information message to confirm the action. All strategies and positions on this account will be deleted. The trading account cannot be deleted. The account used by automated trading features (Lmark) cannot be deleted (see Delta hedger and Market maker). In Option Workshop you can set the commission size for the fill. The commission is configured separately for each account. Information about how to do this is given here. When you create a new order you can specify a target strategy to be filled by the order. Orders placed by DH or MM have the strategy field set to the MM/DH trade strategy. 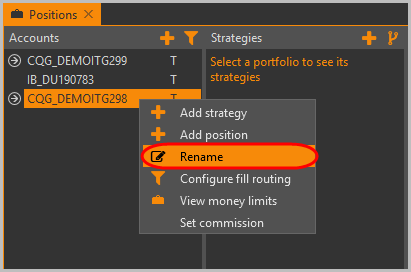 If a strategies’ name is not specified and the fill-to-strategy routing is not configured the fill will be routed to the default strategy. Information about how to configure the fill-to-strategy routing for a trading account is given here. Uncheck the box next to any accounts you want to hide and click the OK button. Click the Select all button to select all accounts with one click, click the None button to clear selection. The selected account will appear in the list. 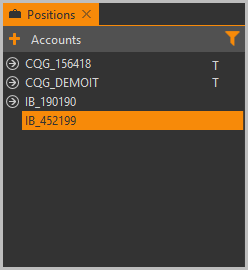 Hidden accounts are available for use when you create new fills, add positions. 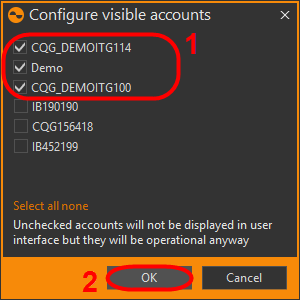 Check the box next to any accounts in the Configure visible accounts form to show it in the list again. A strategy is a set of positions. To view the strategies on any underlying asset, you must select an instrument in the Accounts section. The list of available strategies will display in the Strategies section. The L mark indicates strategies, which are used by Market maker, Delta hedger, FOS. The r/o indicates the actual strategy, which cannot be changed. For trading accounts, Option Workshop creates a special strategy named actual in each portfolio. This strategy always shows up-to-date positions received from the data source. Note that the actual strategy's positions cannot be edited, moved or deleted. The total strategy is created when you select multiple strategies in the list (except the actual strategy). This strategy will contain the net positions of the selected strategies. For example: Let’s say you select from the list strategy “A” with a position of size 4, and "B" strategy with a position of size -7, then the net strategy “A + B” will be created with a position of size -3. 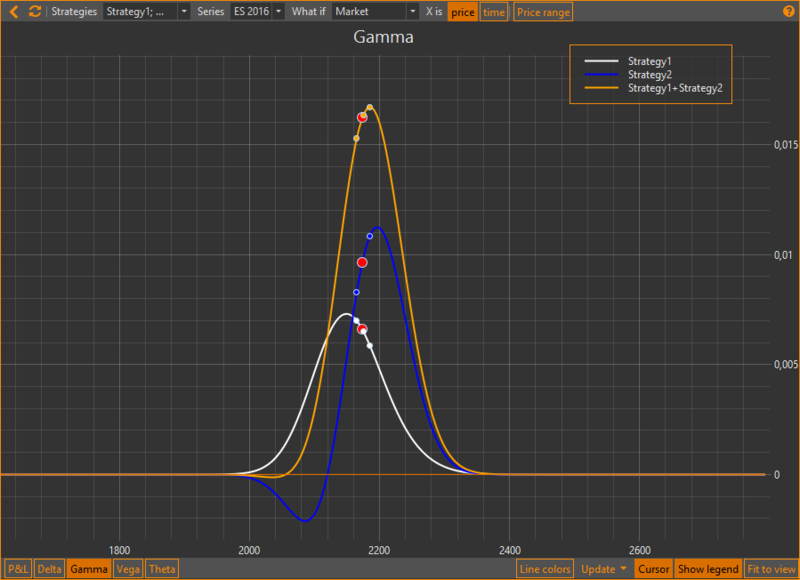 The total strategy is also displayed on the profit/loss chart and the Greeks charts. A strategy is temporary. After changing the selection the strategy will be deleted. Right-click on the account and select the Add strategy command from the pop-up menu. Select an account from the drop-down list or enter a new account name (it will be created automatically). Select an asset from the drop-down list. 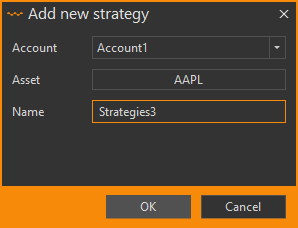 Enter the desired strategy name in the text field. Click the OK button (you also may press the Enter key on keyboard). Note that the account and asset fields will be prefilled with the selected account and asset names. The strategy name actual is reserved for system-defined strategies. You cannot create strategies with the actual name. Copy only positions. The fills that formed the initial position are not copied. For each position in the initial strategy, a position is created in the new strategy. Under each position, there is only one fill. The fill price is equal to the initial position opening price, and the fill size is equal to the initial position size. Copy with fills. Each fill (excluding the adjustment fills) is copied to a new strategy. Select the Copy only positions command in the Create copy submenu. In the Position manager, a duplicate of a strategy is created. Under each position there is only one fill. The fill price is equal to the position opening price, the fill size – the position size. Select the Copy with fills command in the Create copy submenu. In the Position manager, a duplicate of the strategy will be created. Each fill (excluding the adjustment fills) is copied to a new strategy. Click the Notes button on the top panel. Write a comment in the Notes tab. Double-click on the strategy name or right-click on the strategy and select the Rename command from the menu. 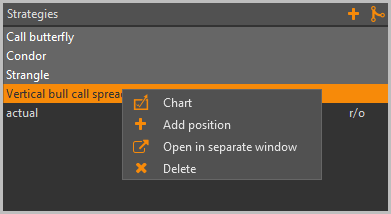 In order to delete a strategy, right-click on the strategy name in the strategy list to open its context menu. Then, select the Delete command. Strategies that do not contain any real fills are deleted without confirmation. The actual strategy cannot be deleted. To delete the strategies, used by Market maker/Delta hedger/FOS (marked with L), you should first disable the Market maker/Delta hedger/FOS. You may view more than one strategy simultaneously by holding down the Ctrl or Shift key on the keyboard while selecting strategies. However, you can only simultaneously view strategies within the same asset portfolio. Also, Option Workshop display fills and positions on instruments that have already expired. Placing the cursor over the row will open a tooltip containing information about position. Spread desk – open a Spread desk. If a strategy name is not specified the fill and positions will be routed into a strategy according to the routing conditions. More in the Fill routing. Right-click on the account or strategy and select the Add position command from the pop-up menu. Select a strategy from the drop-down list or enter a new strategy name (it will be created automatically). Select an instrument from the instruments tree. Correct the position, price if necessary. Note that the position cannot be equal to zero. The account and strategy fields will be prefilled with the selected account and strategy names. You can add a position by using drag-and-drop. 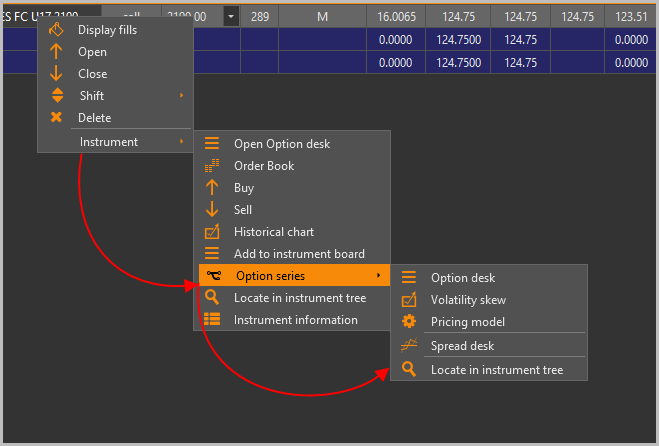 Begin by dragging a row from an Option Desk's table or the Instruments tree and dropping it onto the positions table. This action brings up the same dialog window described above, with the Instrument prefilled. You may correct them if you wish. After you confirm your input, a new position will be created. Note that if a position on a specified instrument already exists in the specified strategy, a new position will not be created. Instead, a new position's size will be added to the existing position's size. Sometimes you may need to correct a position's size or price. In order to do this, click on the position's size or price to enter editing mode. Then you may enter a new value and confirm your input by pressing the Enter key. When you change the positions, the fill will be automatically adjusted in the Fills Manager. Positions can be moved from one strategy into another. Begin by dragging the position from the positions table and dropping it onto the target strategy's name in the strategies list. 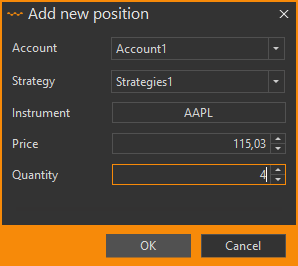 In order to delete a position, click the button and the position will be deleted from the strategy. This action is irreversible and no confirmation is requested. Note that not every position can be deleted. The actual positions cannot be deleted. Total positions (they show aggregated information of all positions within a strategy) also cannot be deleted, no matter what strategy they belong to. A position can be excluded from the calculation, including total position rows, charts, prices and greeks. To do this, uncheck the checkbox at the beginning of the row. When you build a chart for a strategy, excluded positions will not affect the chart. What-if – view the What-if scenarios selection(see What-if scenarios). What-if scenario selection is saved when you switch between the strategies. Select the checkboxes of the columns you wish to see on the position table. Click-and-hold the left mouse button on the column to be moved. Drag the column to the desired location. Release the mouse button to drop the column in its new place. You can also use the and buttons in the Column selection window. To return to the default column order, click the Reset to default button. 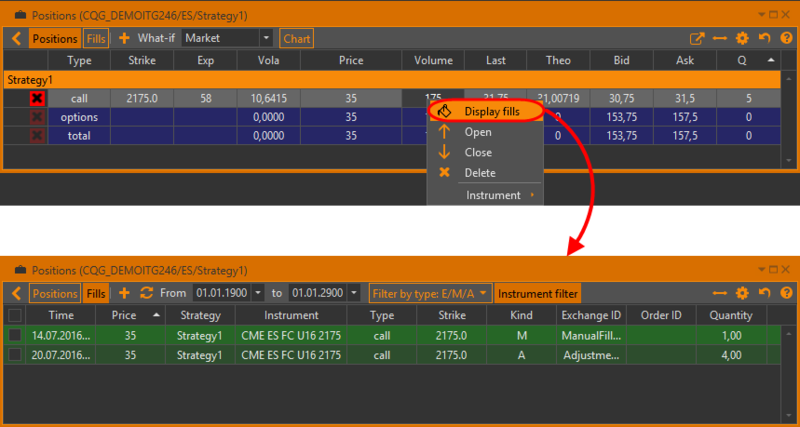 Show options total row – show/hide aggregated information on an option’s position within a strategy. Show position tooltip – show/hide the tooltip containing information about a position. Show zero positions – show/hide closed positions. The general principle of working with fills in Option Workshop (fills types, creating and editing, sorting by strategy, etc.) is given here. You can switch between the positions table and the fills table by using the Fills and Positions buttons on the top panel. When you click on the Fills button a table with all fills in the strategy will open. Another way to view all fills in the strategy is to right-click on the strategy and select the Display fills command. To view the fills of a certain position, right-click on the position row and select the Display fills command. The general principle of working with orders in Option Workshop (creating and placing orders, editing, filter settings, etc.) is given here. Orders tab contains orders that are linked to selected strategies. 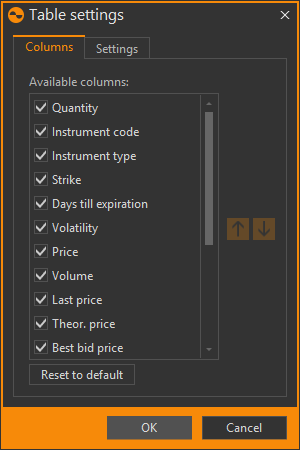 The Risks tab displays one parameter – the total number of underlying contracts to be settled if options in the money are expired right now. In the future, we plan to add several strategy parameters: maximum possible profit and loss, probabilities of profit or loss, and other useful parameters. Enter a comment in the Notes tab.